hi G.B yes i do that a lot. at our local library theres atree with a knarled trunk that looks exactly like an elephants leg, even to the color and way the trunk ends in sortof toe like protusions. looks just like the leg of a big elephant. I even wrote a paper on this for a lesson in a writingclass. The bark looks like a gum tree. I love to look at nature, clouds, wood....just about anything like that and see if I can find a picture. I love to do hidden objects type of games and puzzles. I will go check out the picture now and see what I can see. I am a nature love. I love to look at the photos of mountains,river landscapes and trees sometime. I had never seen such a tree trunk ever before.Its indeed a nice photo. I can see the picture now! It looks more like a dragon in the small thumbnail than close up. It makes a very good dragon! It would be neat if the leaves had turned bright red and were streaming behind it, like fire from its mouth! You certainly have a good eye for pictures, thanks for the smile! I can't find the pic or the discussion in your profile so here's a quick response so that it'll bring it up and I can see it! Hey, even though I'm not really saying anything, it's another cent for ya while I try to see the picture! 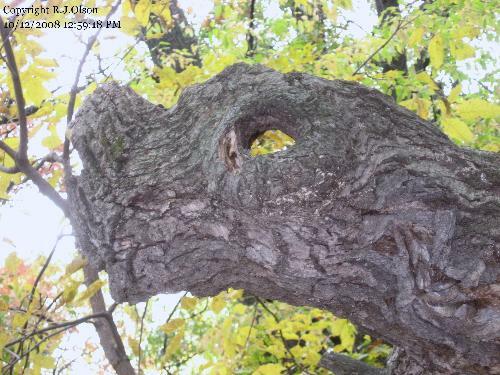 It does look like a dragon. Very cool. I posted a comment on the pic also. I have two pics something like this. One is of a tree that looks like a stick bug to me, and the other is a tree that looks like a fence. I think I'll post the pics here for y'all to see.